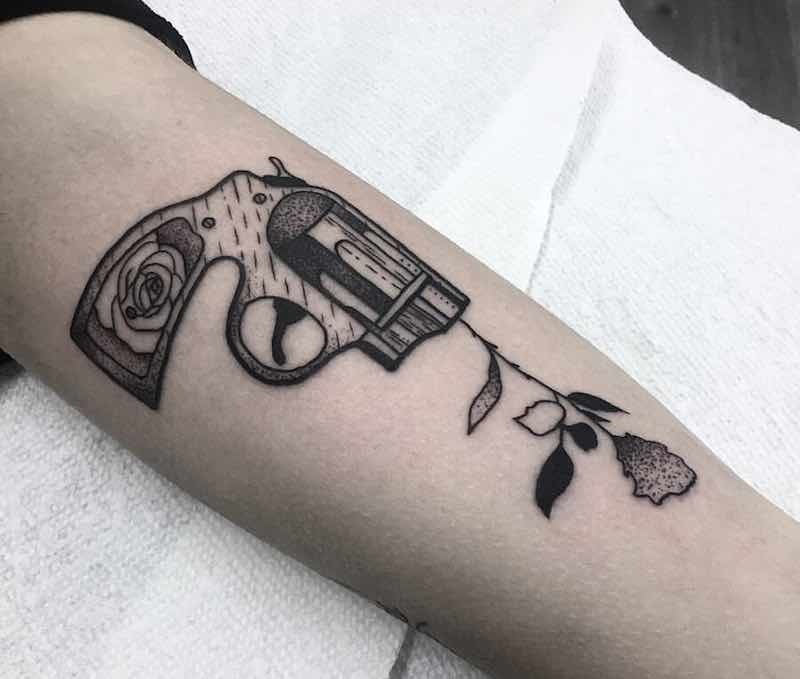 The symbolism of gun tattoos can be completely opposite between two people, it all depends of what a gun represents to somone personally. 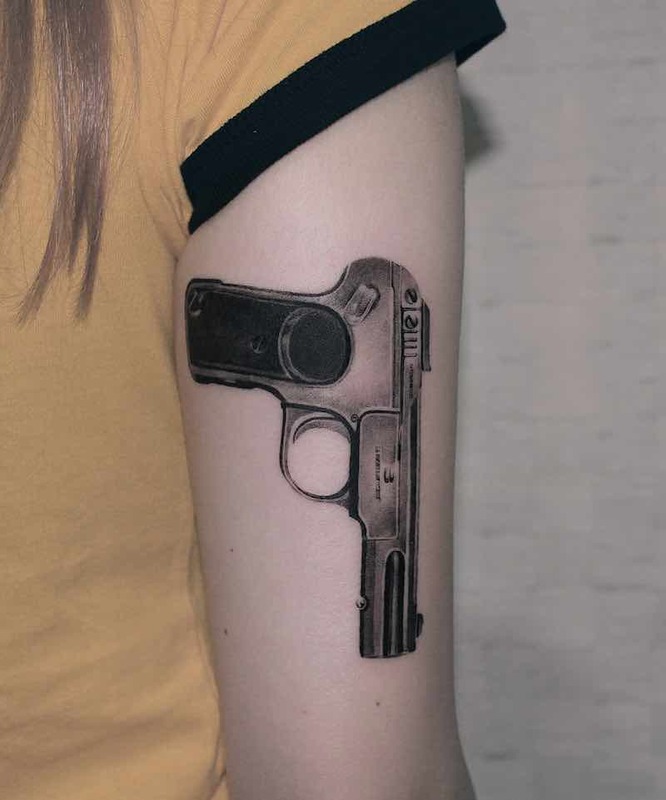 Below is the the most common gun tattoo meaning and symolism. 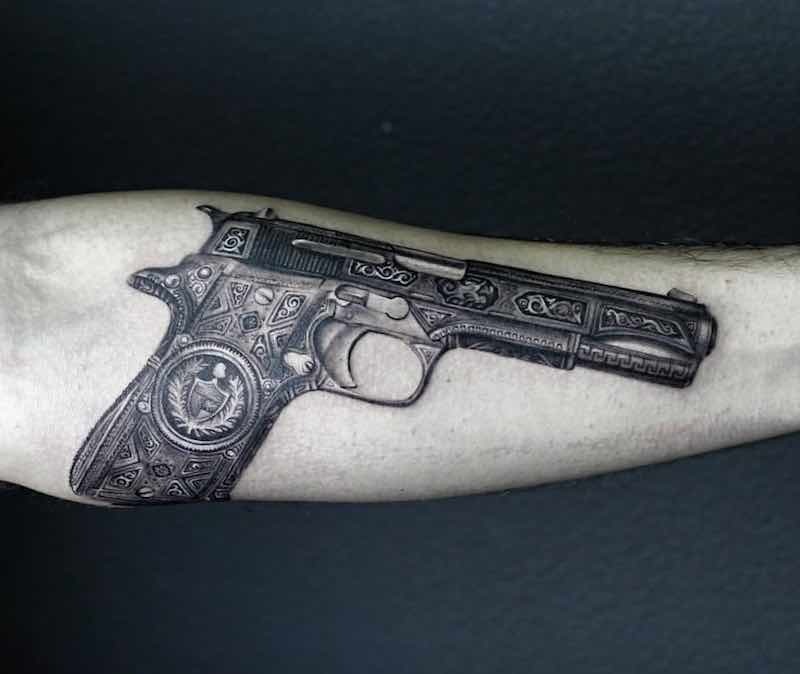 Protection– the imagery of any gun is perfect for representing and symbolizing protection, as this the main reason most people get a gun is because it provides protection for themselves and people around them. 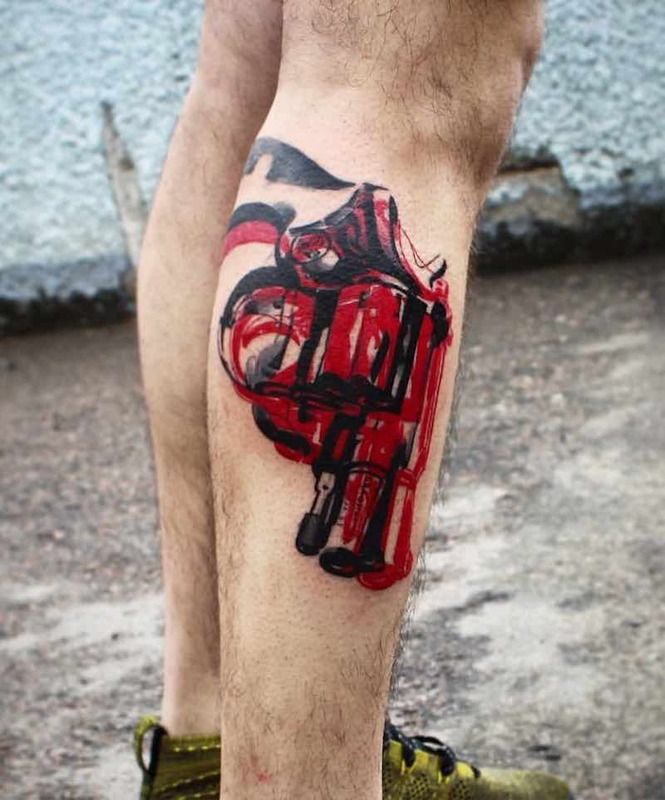 Power– In sports it’s a very popular tattoo amongst athletes wanting to represent the power in their arm with a throw in football or their punch in boxing, many soccer players get a gun tattoo on their leg to represent the power in their kick, throughout many sports its a great way to symbolize power. 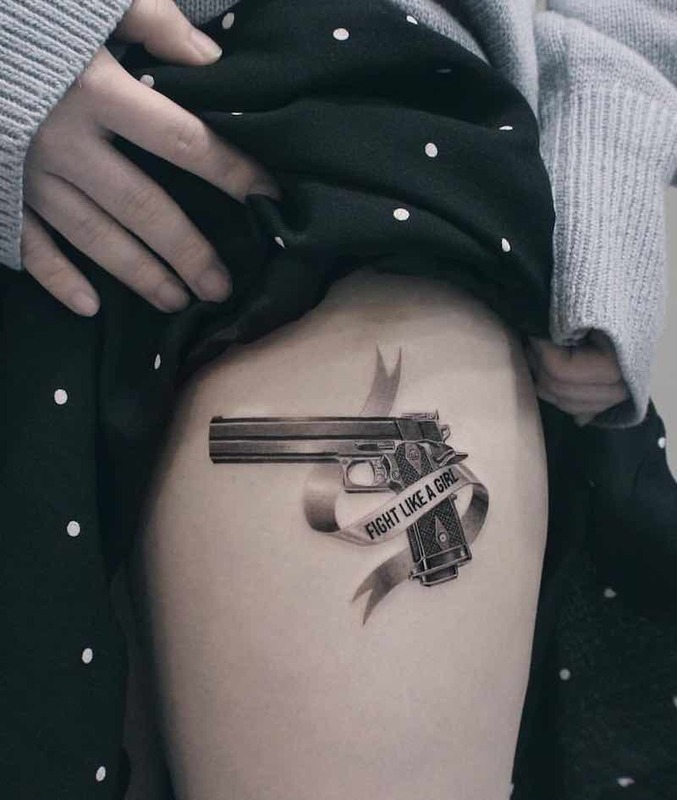 Violence- Its common for people to get a gun tattoo to represent violence, this is usually violence in someones past that they want to leave behind them but still not forget. 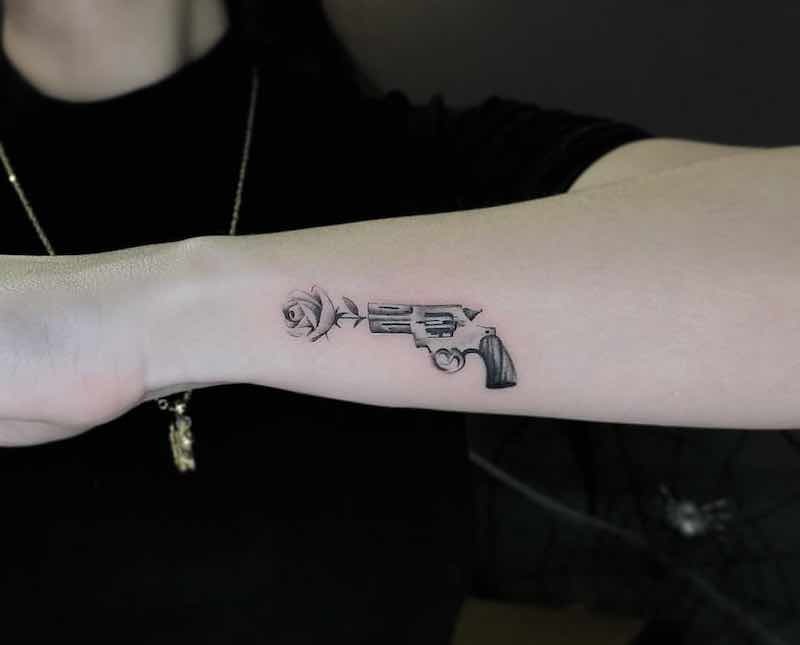 Danger– Any responsible gun owner knows how much of a danger having guns around can be and you certainly don’t need to own a gun to understand the danger involved with a gun so the imagery of a gun is commonly used to represent danger in tattoo designs. 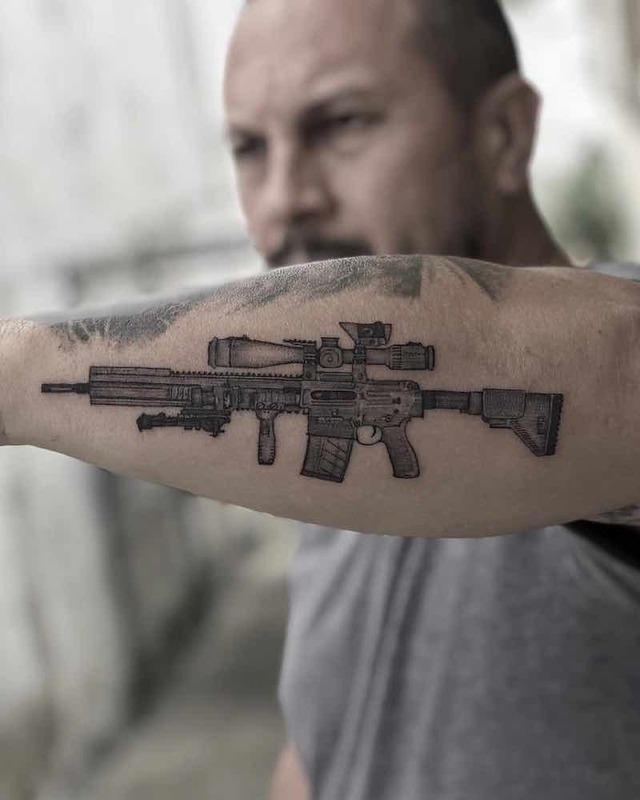 Security– Many people have guns that hope to never use them but it still provides a great sense of security, it’s common for some to get a gun tattoo to remind them of their own or families security. 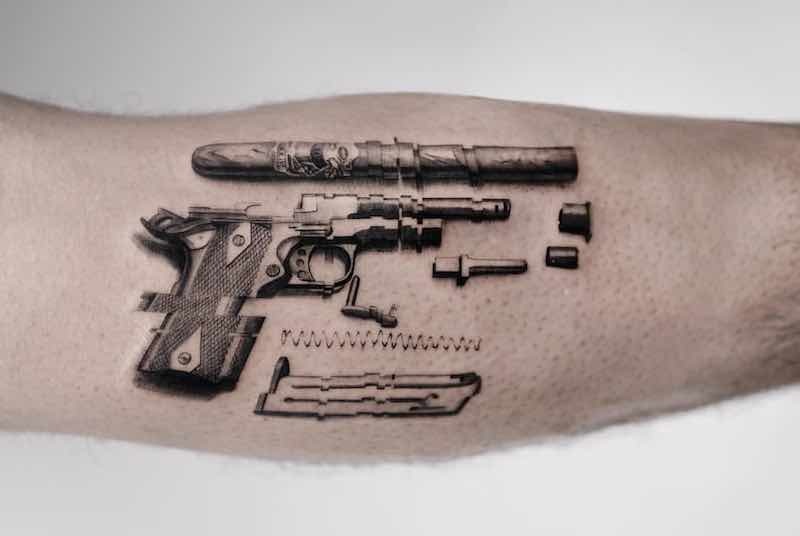 Although there are many ways to design a gun tattoo there are two very different and most popular methods of a gun tattoo, the first being a fine line or single needle tattoo, the results look stunning because of the mechanical aesthetics of a gun a single needle captures all the lines, curves and mechanisms in a very accurate way even when done small, the only downside to these is it may not last long and fade in a fairly short amount of time but if taken care of properly it can last a very long time. 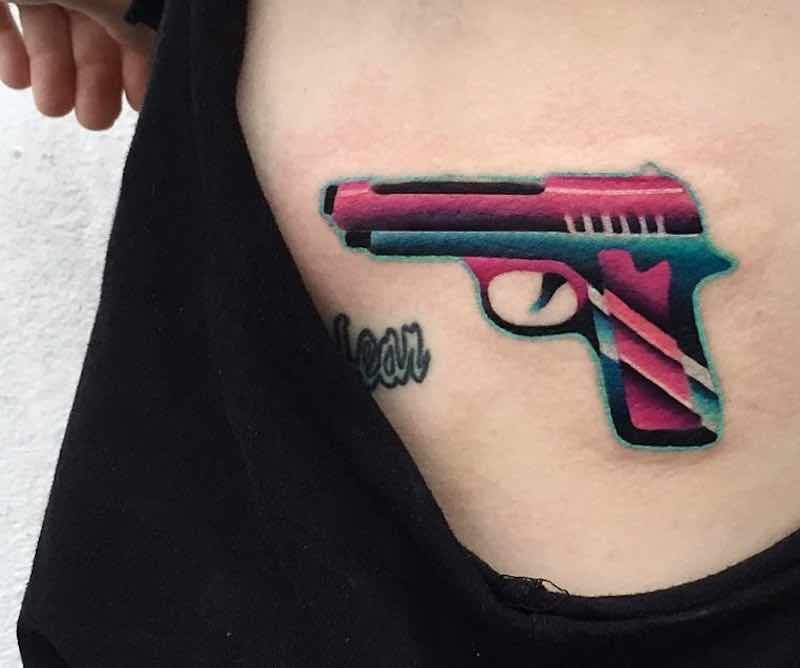 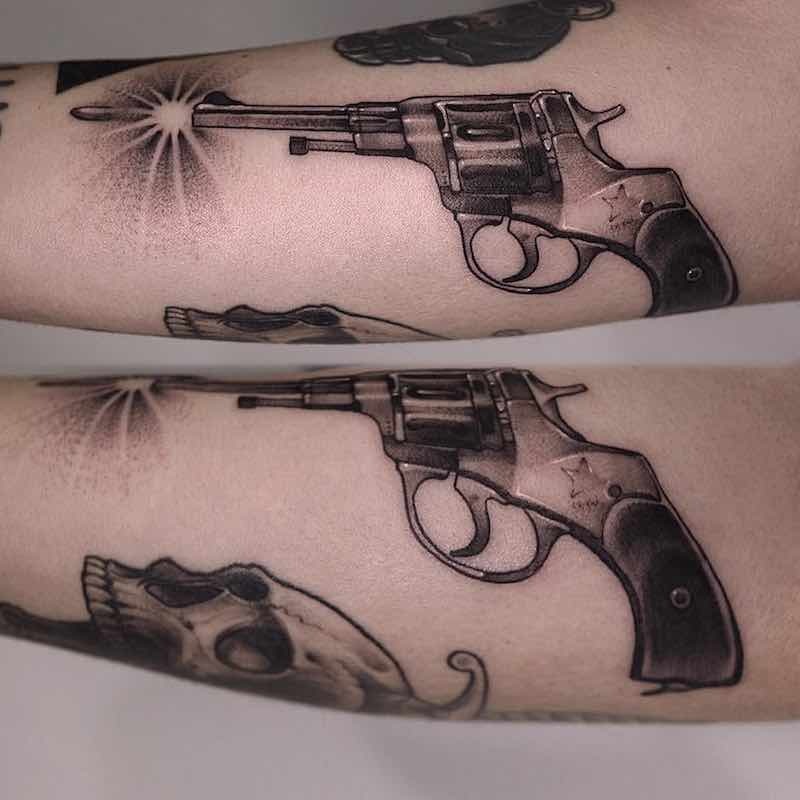 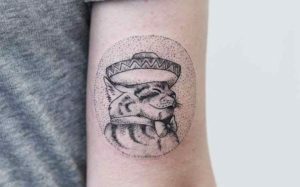 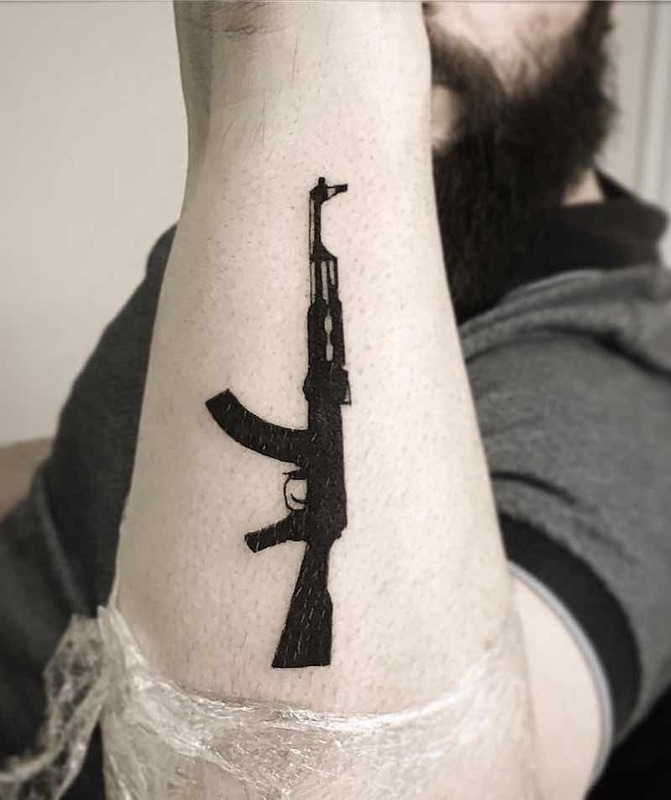 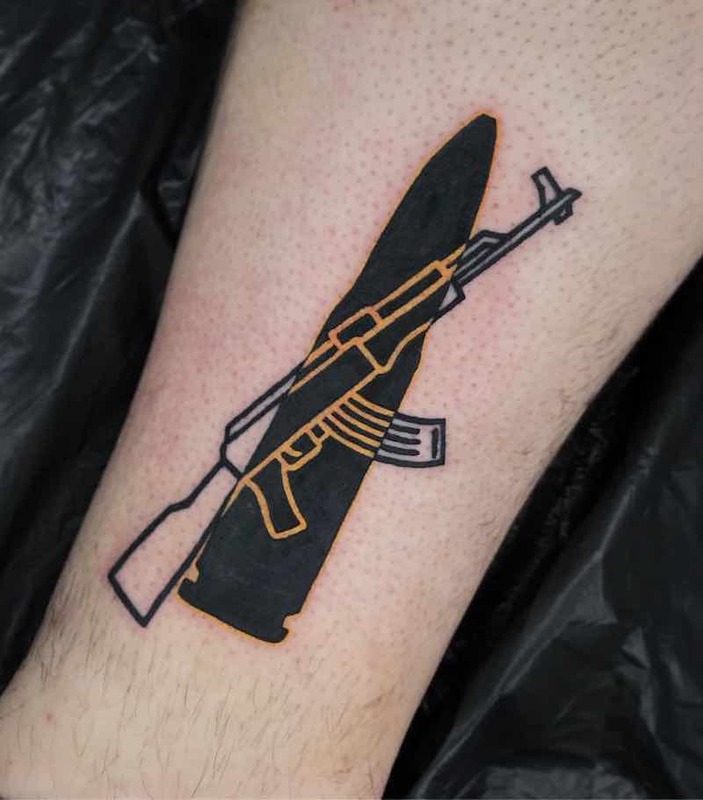 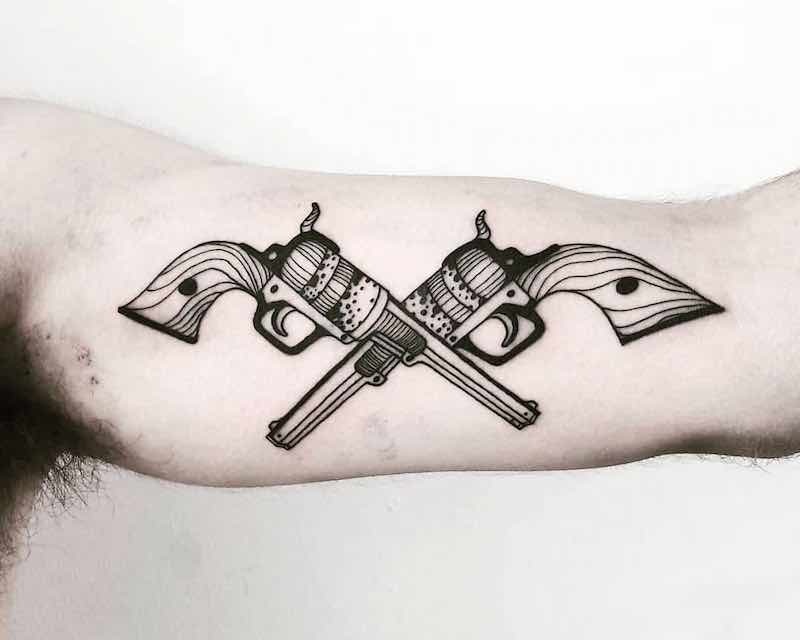 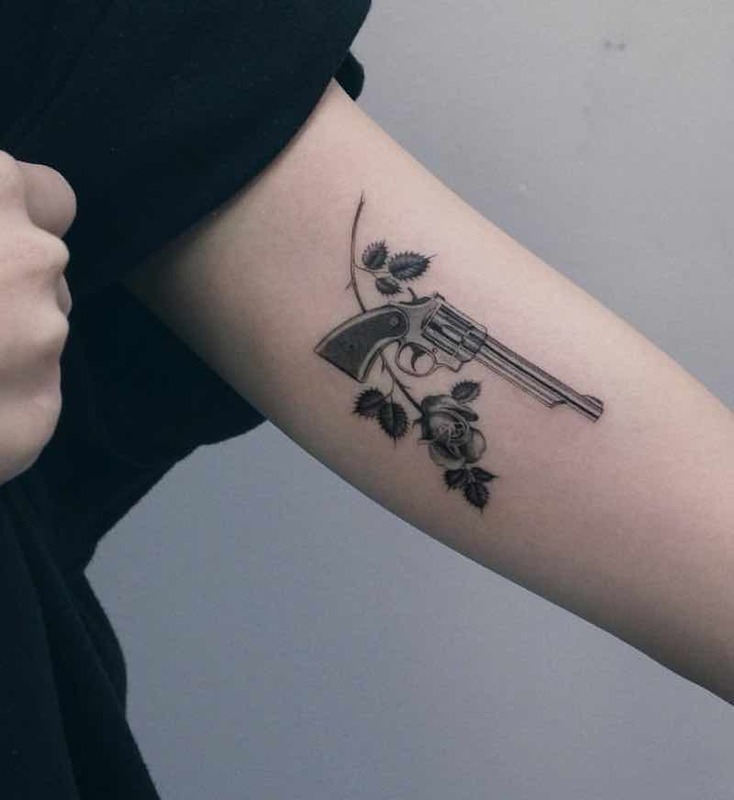 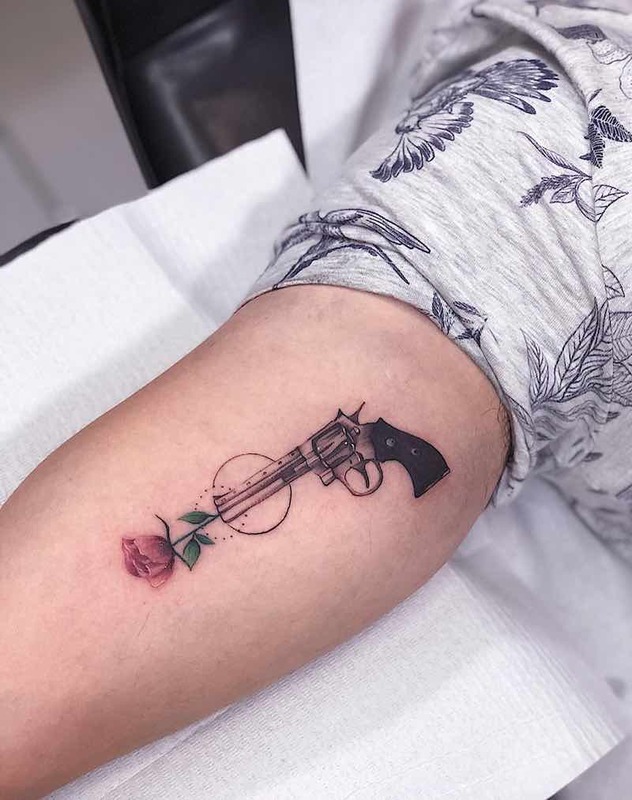 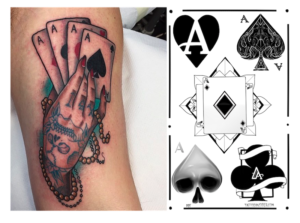 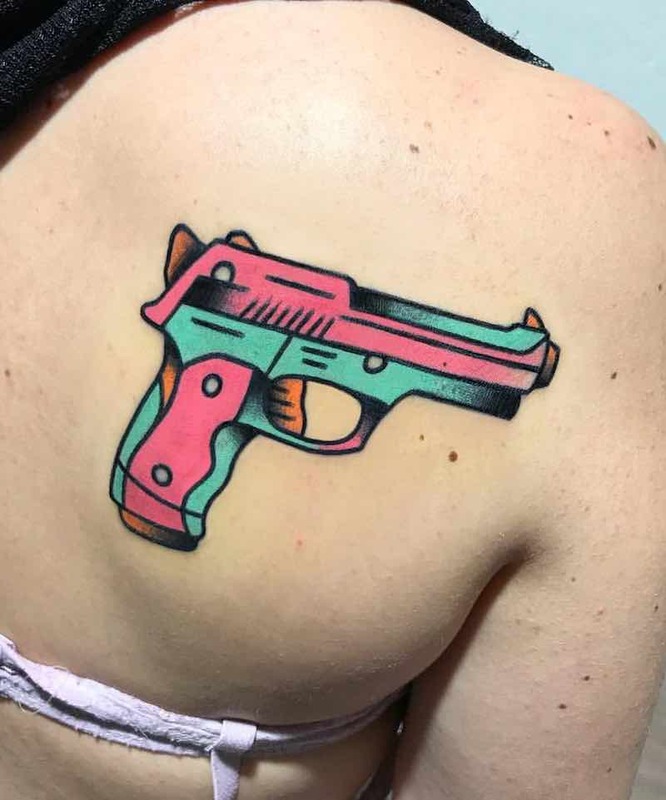 The next most popular type of gun tattoo is a bold line and bigger design, these will last in the long run without needing constant touch-ups and can be more stylised depending on personal preference. 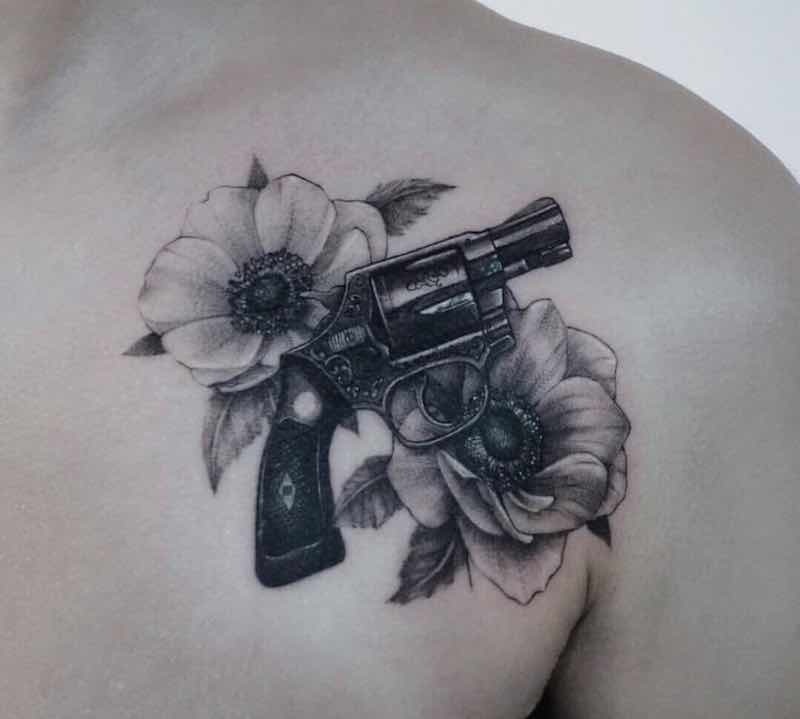 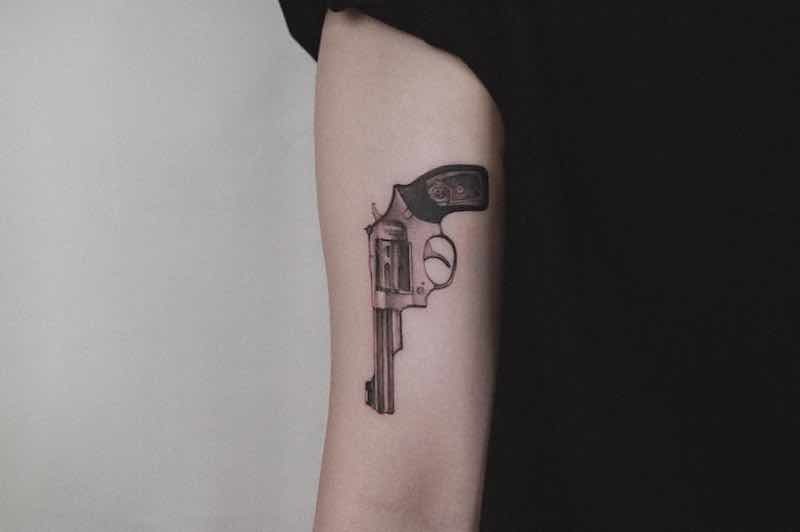 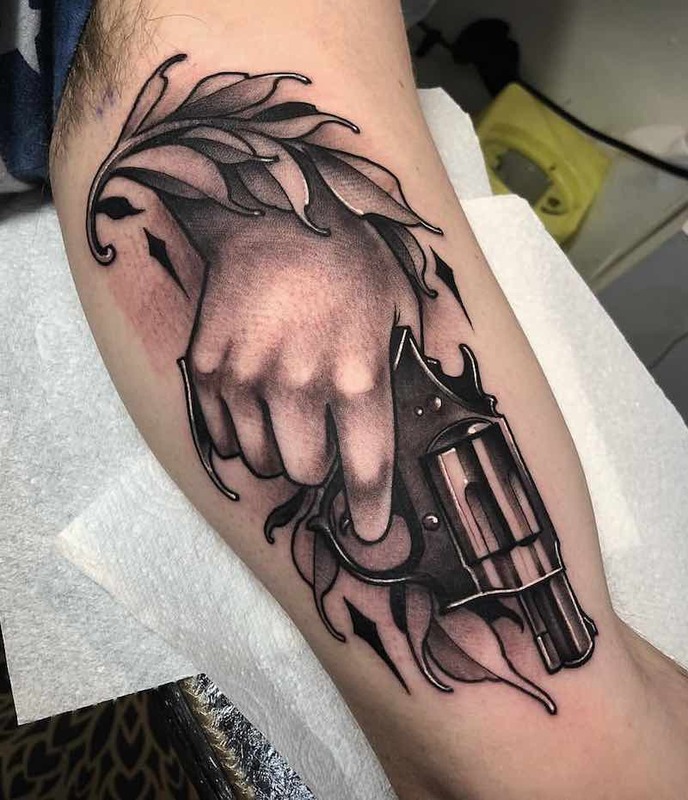 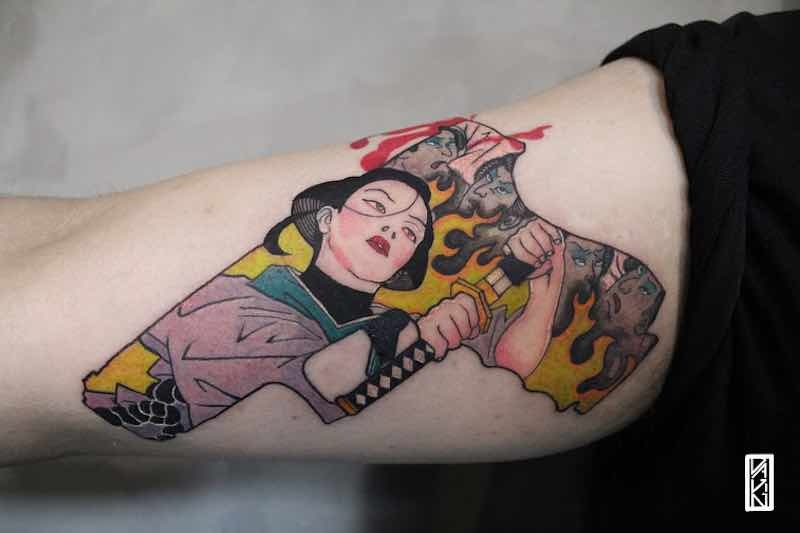 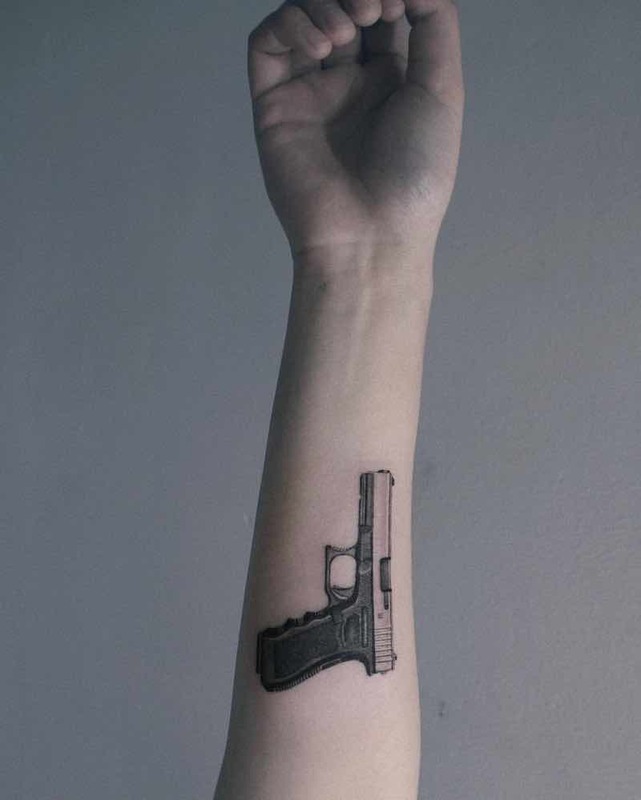 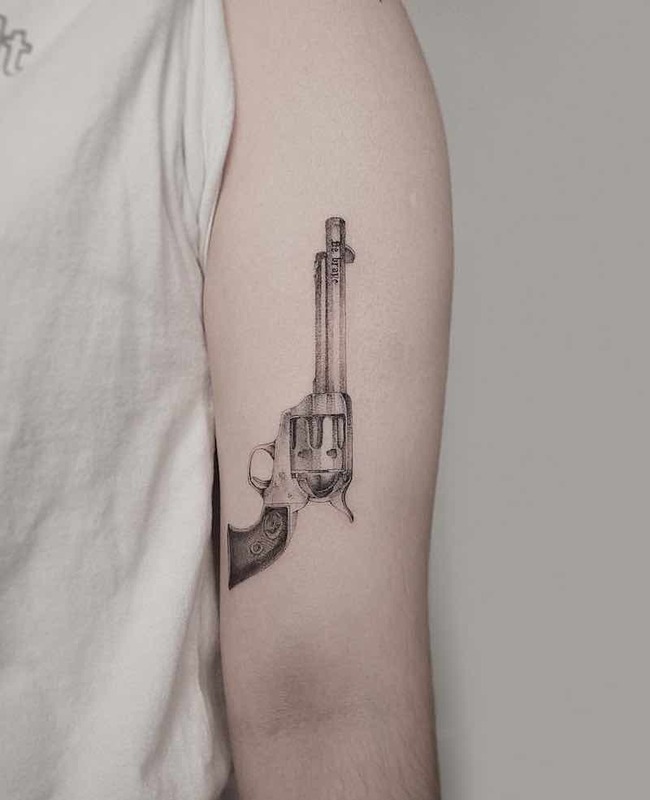 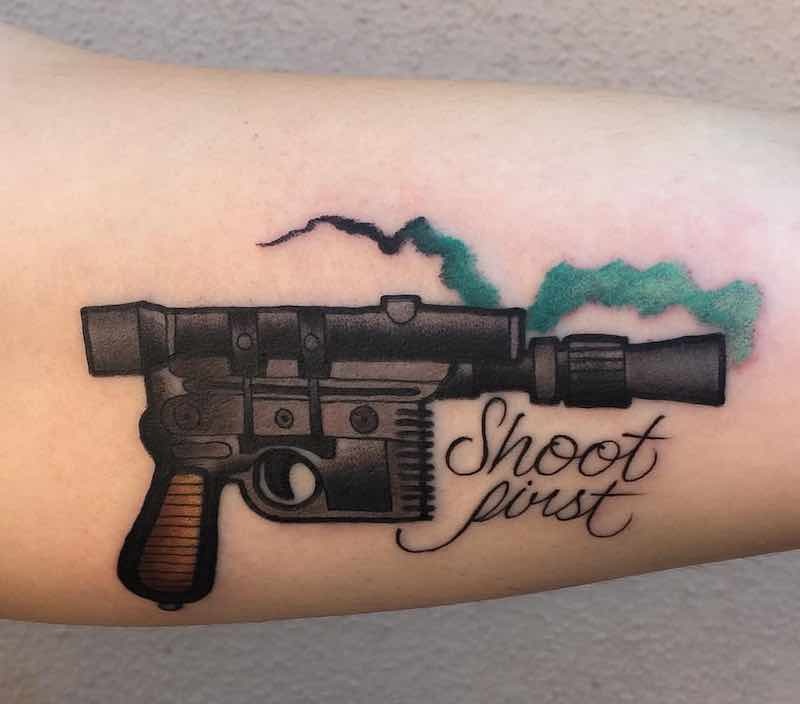 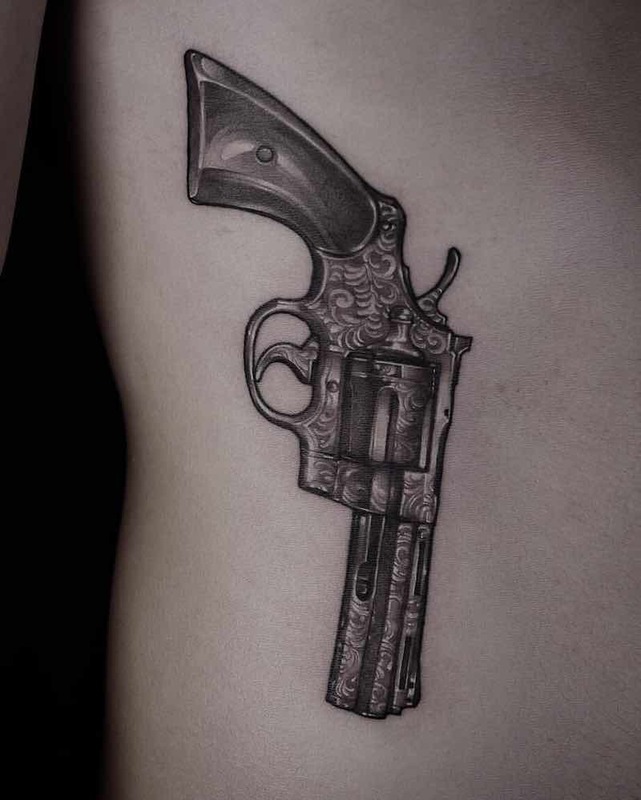 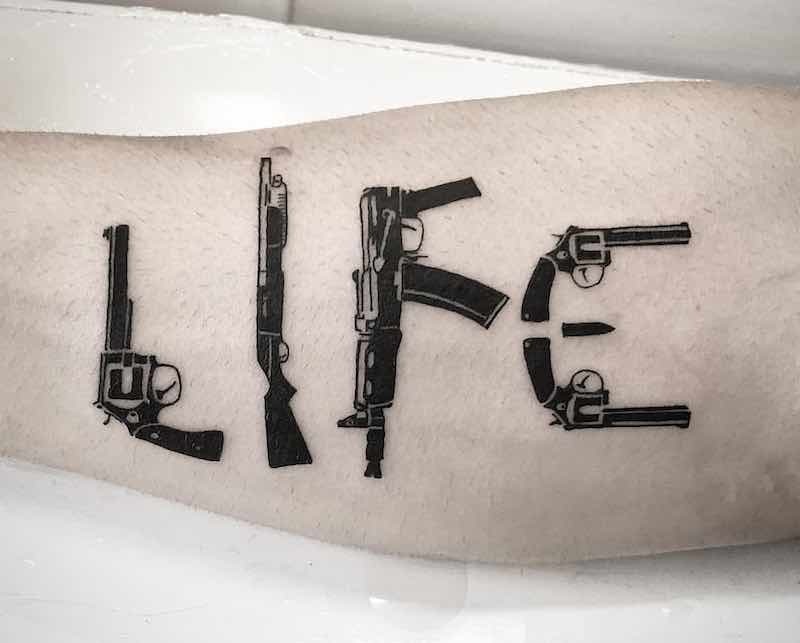 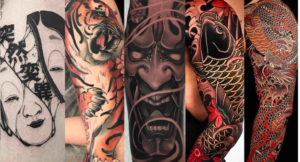 nother type of gun tattoo with its popularity on the rise is realistic, these are somewhere in between the fine line and bold traditional lined tattoos.